Los nuevos mapas publicados en la revista Plos ONE. Los materiales cartográficos se pueden difundir, compartir y elaborar bajo licencia Creative Commons. Fig. 1 – Yasuní Biosphere Reserve and Zona Intangible Tagaeri Taromenane (ZITT): geographical framework. 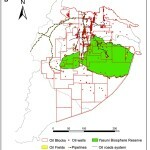 Oil production in the Ecuadorian Amazon Region (9th concession licensing round, 2001). Fig. 2 – Perimeter of Zona Intangible Tagaeri Taromenane (ZITT) including points No. 5, No. 6, No. 7. (IGM Ecuador, scale 1:250,000). Points No. 6 and No. 7 belong to different rivers: the former to the Rio Dicaro, the latter to the Rio Nashiño. Fig. 5 – Spatial analysis of perimeter section between points No. 7 and No. 8 processing satellite scenes from Landsat TM 5. show more Landsat Thematic Mapper (TM) false color composite (4 blue, 5 green, 7 red) of the territory encompassed between points No. 7 and No. 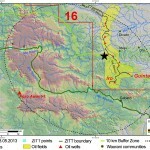 8 in the southern sector of the Oil Block 31 (PetroAmazonas). Boundary section (red color line) does not match the Rio Nashiño river bed (yellow color line). Fig. 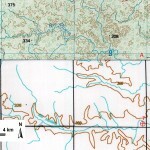 6 – Synthesis map: Yasuní National Park (YNP), Waorani Ethnic Reserve (WER), Zona Intangible Tagaeri Taromenane (ZITT) and oil blocks. 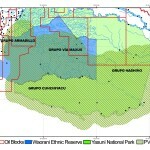 The overlapping systems of territorial complexity in and around the Yasuní Biosphere Reserve: the Zona Intangible (ZITT) is geographically adjoined with productive oil concessions area at the north-west side; on the contrary the north-east sector overlaps both with oil blocks No. 31 (operated by the Petroamazonas national company) and that ITT block (Ishipingo-Tiputini-Tambococha block, Secreteria de Hidrocarburos of Ecuador). The spatial distribution of the Tagaeri Taromenane clans is partially outside the ZITT perimeter in the cases of the Nashiño and the Maxus groups; the Armadillo group is completely outside the ZITT boundary overlapping oil blocks No. 14 and No. 17. Their home range overlaps several titled and untitled land of mestizo (colonos) farmers and non-autochthonous indigenous settlements in the Dayuma and Ines Arango districts, implicating a sensible proximity with roads system related to the Via Auca main axis. 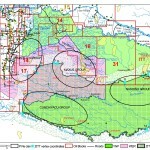 The presence of the Armadillo group in this area is also confirmed by recent violent contacts between the Hormiguero oil platform and the Armadillo oil field. Fig. 7 – Synthesis map of the critical zone around points No. 5, 6 and 7 of the perimeter section: spatial relationships between oil production (block 16), home range of uncontacted Maxus group, and the spot of the Tagaeri Taromenane attack occurred on the 5th March 2013. This synthesis map of the critical zone defined by points No. 5, 6, 7 of the Zona Intangible show sensible spatial relationships between oil production (blocks, fields and wells), the home range of uncontacted Maxus clan, the ZITT perimeter and the Waorani communities settlements. Spatial relationships between oil production areas and the Zona Intangible perimeter section are clearly shown in the map. The attack has major significance in terms of its location since it occurred near the geographic inconsistencies highlighted by this paper: about 100 meters from the Wipsi-1 oil platform, 10 km from point 7, almost 20 km from point 7, along the border of the Buffer Zone. 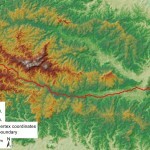 Background raster map has been assembled using a SRTM DEM model to also show geomorphological characteristics of the area. Fig. 8 – Synthesis map of the Zona Intangible. Recognizing the complex territory of uncontacted Tagaeri Taromenane: from geometry to geography. The map results from the combination of human right policies (Zona Intangible Tagaeri Taromenane) representing also the Buffer Zone (normally avoided in official maps), the oil concessions for hydrocarbon production and the spatial patterns of Tagaeri Taromenane (combining the results of data about paths and presences). Considering the power of images in shaping territorial representation, cartography science has the responsibility in formulating more complex discourses about controversial territories. Land cover map (Landsat ETM+, 2002) of the Via Auca territory and anthropic pressures on the Zona Intangible and the uncontacted indigenous group. Deforestation processes developed by road systems around the Via Auca main axis, African Palm cultivations (yellow areas at the north sector), Zona Intangible Tagaeri Taromenane, Armadillo uncontacted clan and oil blocks. 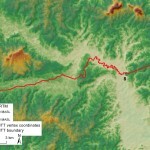 Expansion of the Via Auca road network towards the Yasuní National Park and the Waorani Ethnic Reserve. Oil blocks (yellow lines), historic incidents (red stars) between uncontacted Tagaeri Taromenane groups and external actors, and protected areas. 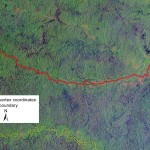 Road network in 2009 by black lines (MAE, 2009) and spatial evolution to the east in 2011 developed by GPS survey (red lines). 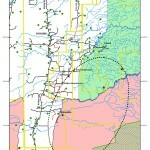 The map also show the uncontacted Armadillo home range overlapping several oil blocks and the mestizo farmer settlements. 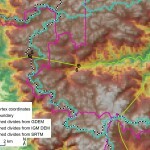 Comparative GIS analysis of catchment’s divides by different Digital Elevation Models. 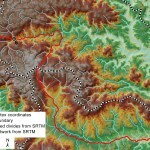 Catchment’s divides are obtained by three different DEM maps (IGM Ecuador, SRTM, GDEM). Even if they present some spatial differences, all of them confirm that points No. 5 and No. 6 belong to different river basins. The first one belong to the Rio Yasuni, the second one to the Rio Curaray. Details of the boundary section nearby point No. 8 which drifts away from the Rio Nashiño river bed. 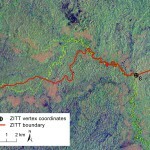 Detail of the Landsat TM 5 satellite scene and the boundary section close to point No. 8. The boundary section drifts away from the Rio Nashiño riverbed runs over a hill’s ridge in two spots, violating both the terrain morphology and the same official text (Decree 2187, 2007). 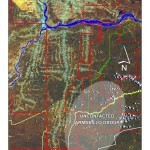 Andes-Petroleum company and the cartographic suggestion to modify the perimeter of the Zona Intangible. 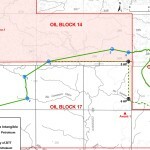 Andes-Petroleum company (China) suggested to the Ministry of Energy (Ministerio de Energia y Minas) and its Environmental Department (DINAPA) to modify the perimeter in order to facilitate oil exploitation in the area maintaining direct access to the proved oil field called Awant-1. This map shows the “cartographic suggestion” of Andes Petroleum to create –according to its productive requirements – a special corridor to exploit the Awant-1 oil field which is localized 12,8 km to south point No. 6, inside the same ZITT area.